This book, Bleeding Out (Internally) consists of two parts, A and B. The sizes of the two parts are slightly different so it is not obvious that they belong together. Part A is a picture book intended to be touched, pages turned and held close by the reader. The images are representations of the sublime in the materiality of blood or bleeding out (internally). Part B is an instructional manual trying to make sense of a short, traumatic, catastrophic event such as uncontrollable internal bleeding. The patient and the witness experience this event simultaneously but not together. This book frames an episode of bleeding out (internally) as the narrative of a very short illness. The physical beauty of blood in part A is coupled with the educational, instructional manual in part B to examine the differing body mind responses. 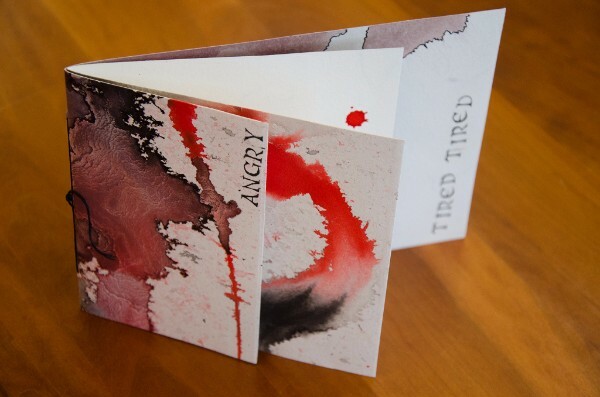 Through the artist book format, the physical action of turning the pages and touching the images, the viewer is encouraged to have an intimate, physical relationship with the material. This book is part of a larger artistic project called Blood on Silk looking at medicalised death, primarily in ICU.